Cindy Crawford, Linda Evangelista, Jake Bugg, and nine other international stars from the acting, music, and fashion world have posed for legendary musician Bryan Adams to raise awareness about the importance of good hearing and the consequences of hearing loss. The limited edition 2017 Hear the World calendar is available for $40 USD today. One hundred percent of the proceeds benefit the Hear the World Foundation, a non-profit that aids disadvantaged people, particularly children, with hearing loss. According to the World Health Organization, over 360 million people (5% of the world’s population) and an estimated 32 million children are affected by disabling hearing loss. In the U.S., two to three of every 1,000 children born have a detectable level of hearing loss in one or both ears. Most of the people with hearing loss live in low to middle income countries and often don’t have access to ear medical care. Founded in 2006, the Hear the World Foundation (#heartheworld) has given thousands of people with hearing loss the chance of a better life. It focuses particularly on projects for children with hearing loss, to enable them to develop at an appropriate rate for their age. The foundation, which has supported over 80 projects on all five continents, provides financial resources, donates hearing aids and audiological accessories, and trains project workers in audiology on site. The calendar is the ideal holiday gift for anyone who wants to give a stylish gift while supporting a good cause. 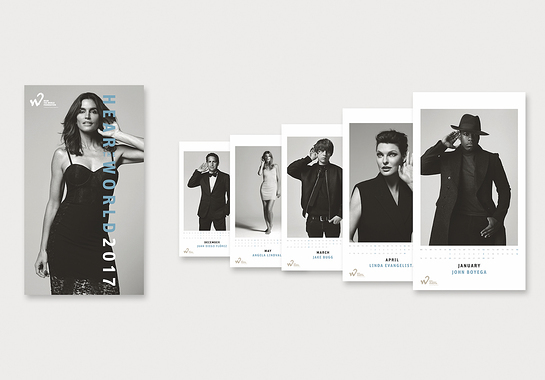 The limited-edition 2017 Hear the World calendar contains 12 black-and-white portraits of stars all featured in the signature Hear The World pose with one hand behind the ear. Stars include cover model Cindy Crawford, Star Wars’ actors Mads Mikkelsen and John Boyega, The Who frontman Roger Daltrey, opera singer Juan Diego Flórez, singer-songwriter Jake Bugg, singer Eliot Sumner, and famous models Jeanne Damas, Linda Evangelista, Lottie Moss, Angela Lindvall, and Imogen Waterhouse. All of the celebrities volunteered at no cost for the project. One hundred percent of the proceeds, $40 USD per calendar, benefit the project work of the Hear the World Foundation, which provides people, particularly children, around the world with better hearing. The calendar can be ordered here.